Shop Amazon & Benefit VFMS! You are here: Home / Spirit Store / Shop Amazon & Benefit VFMS! Many of our VFMS families are already shopping on Amazon.com — there’s nothing you can’t find on Amazon! But did you know that every time you shop on Amazon, you could be benefiting the VFMS PTO? You can support VFMS PTO every time you shop, at no cost to you – when you shop Amazon through AmazonSmiles. Choose us as your charity, and Amazon will donate 0.5% of your eligible purchases to VFMS PTO. 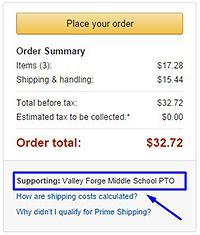 To begin shopping for VFMS PTO, you only need to select us as your charity one time, then remember to use our Amazon link at the top of our website each time you shop. That’s it! 1. Choose “Valley Forge Middle School Parent Teacher Organization” as your charity. You only need to select your charity one time. To designate the PTO as your charity, click this link: http://smile.amazon.com/ch/23-2936863. Alternately, you can enter Amazon through http://smile.amazon.com and you will be prompted to choose your charity. Type in “Valley Forge Middle School Parent Teacher Organization” and select us when the result returns. 2. Shop through AmazonSmile. Once you have chosen your charity, Amazon will remember this for future visits; you do not need to select your charity each time you shop. However, you DO need to begin your shopping session by entering Amazon through http://smile.amazon.com, or simply click the link at the top right of any page of the VFMS PTO website. You can also bookmark http://smile.amazon.com for your convenience. If you begin your shopping session by going directly to amazon.com instead of AmazonSmile, your purchases will not be tracked through AmazonSmile and we will not receive the donation. You can be sure you are shopping for VFMS PTO by looking at the top left of your screen while you are shopping on Amazon. You should see the AmazonSmile logo, and Valley Forge Middle School PTO as your supporting charity. Helpful Tip: already have a cart full of items at amazon.com but forgot to start shopping at AmazonSmile? No problem. With your items in the cart, simply type http://smile.amazon.com in your browser’s address bar and hit enter. You will then enter AmazonSmile, but all of your purchases are still in your cart. No need to empty your cart and start over! AmazonSmile is an excellent way for VFMS PTO families to contribute to our school and our students without having to give up any extra time or money. If all of our parents who use Amazon would remember to shop through AmazonSmile, we could significantly increase our annual fundraising without having to ask our families to do any more than they already do to support us!